She said: “It’s just fantastic. We’ve been trying so hard to have a winner here at the Festival. I’m delighted for [owner] Sandy Seymour. It’s his first horse but what a horse to have. “This is what you work for. We’re always looking for horses and trying to get them into the right races. It’s great that the right race happens to be here at Cheltenham. Paying tribute to her team, which includes her partner, the former champion jockey Peter Scudamore, Russell added: “It’s not just about me. It’s about all the lads back at home, it’s about Campbell [Gillies], who rides the horse and Sandy. It’s great for them all. “He’s not the fastest horse in the world but he just doesn’t like others passing him. He jumps really quickly and maybe he does go on good ground as well as soft! Brindisi Breeze provided young Scottish rider Campbell Gillies with his first Cheltenham Festival success, with a little help along the way from a rival. The six-year-old gelding was in the front rank for most of the race and leading the way as the field began to make the descent before the final uphill run. Scudamore is son of Peter Scudamore, partner of Brindisi Breeze’s trainer Lucinda Russell. Gillies, from Musselburgh, was also winning his first Grade 1 contest. “It was tough for him to go out and do it from the hard end,” said the 21-year-old. 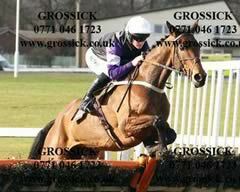 “We had been slightly worried about the faster ground, but he was taking lengths out of them at his hurdles. He’s so athletic and was electric through the air today. “Going to the first hurdle he was pricking his ears at the noise from the stands, looking around him a bit. Going to the last he was a bit the same - he’d been in front long enough and was coming back under me a bit. Eight-time champion jockey Peter Scudamore will always be a man of Herefordshire, but he was delighted to cry out ‘Flower of Scotland’ when Campbell Gillies rode into the winner’s enclosure after winning on Brindisi Breeze. Scudamore is partner to winning trainer Lucinda Russell, very much a Scot, who was congratulated on her win by fellow countryman Ronnie Bartlett, whose company sponsored this Grade One hurdle. Reflecting on the triumph, Scudamore, who is analysing this week’s racing for BBC Radio 5 Live, said: “When you’re riding it’s such an individual thing, although having said that Martin Pipe and I worked very closely together. But this is very much about teamwork and I’m thrilled for Lucinda who works so hard. “It’s also rather special when you are the underdog - when Willie [Mullins] says he’s bringing over his best novice hurdler in Boston Bob [who was second] then you do feel a little anxious. 2. The inaugural running went to Moulin Riche, trained by Francois Doumen in France and partnered by Robert Thornton. Thornton enjoyed a second success aboard the Alan King-trained Nenuphar Collonges in 2008. 3. Trainer Jonjo O’Neill and jockey A P McCoy combined to take two consecutive runnings with impressive winners – Wichita Lineman, who scored by 12 lengths in 2007, and Black Jack Ketchum, a nine-length winner in 2006. Both started favourite. 4. Weapon’s Amnesty became the first Irish-trained winner of the Albert Bartlett Novices’ Hurdle in 2009, taking the spoils for trainer Charles Byrnes and jockey Davy Russell. He returned to The Festival in 2010 to win the RSA Chase. Berties Dream doubled the Irish tally when scoring in 2010.